The missing doctrine in Christendom is in the Bible but very rarely taught. I’m going to explain this doctrine to you today and I know it will absolutely thrill your heart like nothing else. Christians are taught that when they die the go to where? Heaven or hell. Contrary to popular thought, heaven is not contrasted against hell in the Bible. Heaven is contrasted against the earth. “Heaven and earth” is the contrast. Matthew 16:19 And I will give unto thee the keys of the kingdom of heaven: and whatsoever thou shalt bindon earth shall be bound in heaven: and whatsoever thou shalt loose on earth shall be loosed in heaven. Do you get the picture? Heaven is contrasted against the earth, not hell. Now try to find a verse that contrasts heaven against hell… I’m waiting… I’m waiting… Let me know if you do find one in the comments below this article, but even if there is one, the predominant thought is heaven vs. the earth. The city was laid out like a square, as long as it was wide. He measured the city with the rod and found it to be 12,000 stadiac in length, and as wide and high as it is long. The twelve gates were twelve pearls, each gate made of a single pearl. The great street of the city was of gold, as pure as transparent glass. That, my brothers and sisters in Christ, is our ultimate destiny and destination. The untold doctrine is that God wants to come down to earth to dwell in and with His people, not that God wants to take us up to heaven to be with Him there. That’s quite a different doctrine than most of us have been taught. It means that God will be right in and with us on the new heaven and earth. The new heaven and earth will come after the 1000 year reign of Christ on earth, commonly called “the Millennium,” and after the Great White Throne Judgement. No longer do you have to wonder about going to heaven, floating on clouds, playing harps and smoking 50 cent cigars, singing praised with nothing else to do but be in constant “bliss.” Such nonsense is the result of people not learning and teaching the accurate Word of God. How far we are from the truth in most Christian ‘circles’ today. I call them ‘circles’ because all they do is run around in circles repeating the same age-old, wrong doctrines that they’ve taught since the beginning. My heart goes out to those who want to separate truth from error, who seek the truth who is Christ more than anything else including association with any denomination, leader or institution here on earth. All these earthly things shall pass away, but the Word of God lives and abides forever. I Peter 1:22-25 Now that you have purified yourselves by obeying the truth so that you have sincere love for each other, love one another deeply, from the heart. God puts such an emphasis on ‘truth’ in the Word that it’s hard to understand why people refuse to believe it as it is written. Let us not be like those who cling to nonsensical doctrines of men but rather let us embrace the truth which endures forever. 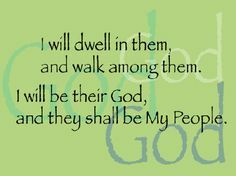 God will dwell in and among His people on the new heaven and earth and nothing is going to stop that from happening. Rejoice you who are His! Thank Jesus for what he has secured for us by his sacrifice and resurrection!